Females are born with a finite number of eggs that are steadily depleted throughout their lifetime. This reserve of eggs is selected from a much larger pool of millions of precursor cells, or oocytes, that form during fetal life. So there is a substantial amount of quality control during the process of forming an egg cell, or ovum, that weeds out all but the highest quality cells. New research from Neil Hunter's laboratory at UC Davis reveals the surprising way that this critical oocyte quality control process works. Previous research in the Hunter lab showed that a gene called Rnf212 is required for chromosomes to undergo crossing over during the early stages of oocyte development. The researchers were surprised to find a new, late function for Rnf212 in the oocyte selection process. The results are published Sept. 27 in the journal Molecular Cell. During oocyte quality control, a decision is made whether each oocyte should continue and join the reserve of eggs, or undergo apoptosis — cellular death. "We almost stumbled upon this role in oocyte quality control when Joe (Huanyu Qiao, joint first author) first noticed that the Rnf212 mutants had more oocytes in their ovaries," said Hunter, professor of Microbiology and Molecular Genetics and an Investigator of the Howard Hughes Medical Institute. Hunter is senior author on the paper. 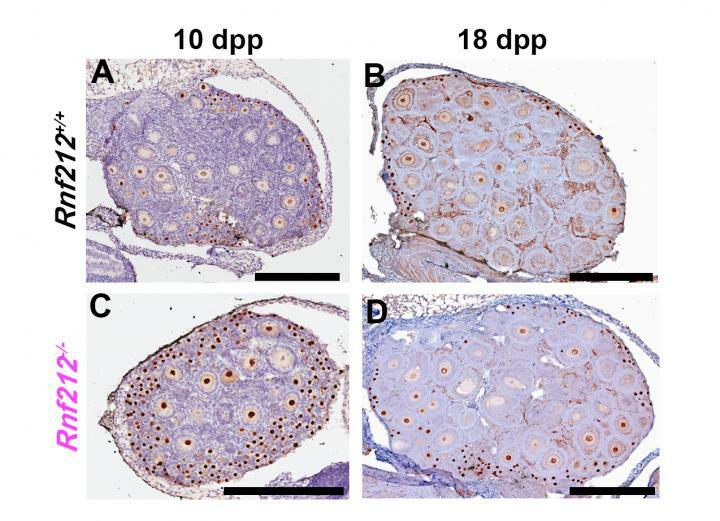 In mice that lacked Rnf212, more oocytes were able to pass through quality control checkpoints, increasing the overall size of the ovarian reserve. During the formation of gametes (sperm and eggs), portions of the parental chromosomes are swapped through the formation and repair of DNA breaks, a process called crossover. If the crossover process is defective, the repair of some DNA breaks is delayed. RNF212 helps tag these lingering breaks so that defective oocytes are sensitive to apoptosis. The researchers found that RNF212 prevents the repair of lingering breaks to create a "cellular memory" of defects that occured in earlier stages of development. This allows the cell to assess how bad the defects were. If the number of unrepaired breaks passes a critical threshold of around ten, the cell is deemed to be of poor quality and undergoes apoptosis. If there are only a few lingering breaks, repair is reactivated and the oocyte is allowed to progress and become part of the ovarian reserve. "It seems counterintuitive that a cell would actively impede DNA repair, but this is how oocytes gauge the success of earlier events. High levels of lingering breaks means there was a problem and the oocyte is likely to form a low quality egg," Hunter said. Female fecundity depends primarily on two factors: the size of her ovarian reserve and the quality of eggs in it. Thus, the reproductive system must balance quality and quantity of oocytes for optimal fertility. In mice without RNF212, lingering breaks are quickly repaired allowing significantly defective oocytes to sneak through quality control. Thus the overall size of the ovarian reserve is increased at the expense of oocyte quality. Many such oocytes would likely terminate early in a spontaneous miscarriage, causing fertility issues. Fetuses that develop further would have a higher risk of severe developmental defects. "Basically, anything that goes wrong in the germline is a risk for congenital disease," said Hunter. Previous research has shown that variants of the Rnf212 gene affect the rate of chromosome crossovers. This new work suggests that Rnf212variants might also affect the size and quality of ovarian reserves. Authors on the study in addition to Hunter and Huanyu Qiao are H.B.D. Prasada Rao, Yan Yun, Sumit Sandhu, Jared H. Fong, Manali Sapre, Michael Nguyen, Addy Tham, Benjamin W. Van, Tiffany Y.H. Chng and Amy Lee. The work was partly supported by grants from the NIH.